Why Choose Airplane Banner Advertising At NASCAR Events? 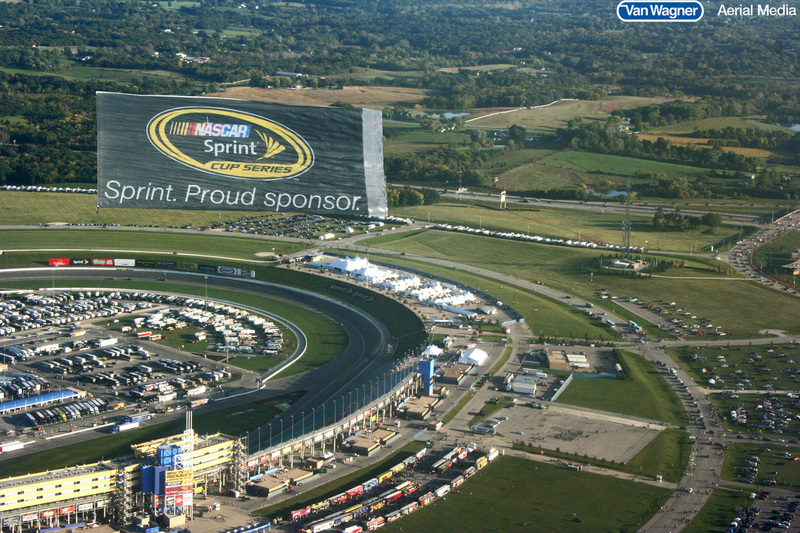 Aerial advertising comes in at a fraction of the cost of NASCAR sponsorship, and makes a big impact. Aerial media works best when you have a large, captive audience in one place, and NASCAR makes a perfect venue. Instead of paying for your logo to grace the driver’s jumpsuit or vehicle, you could fly your messaging on a larger-than-life aerial banner, AND have control of what you’d like it to say. NASCAR fans arrive around 5 days before the actual race. Your banner towing plane could fly the day of, and every day leading up to the big event for maximum CPM value. If you’re a brand that’s trying to market to men or sports fans, NASCAR races are a great place to start. Van Wagner Aerial Media can help you put together a creative campaign that’s bound to grab the attention of fans on the ground below. Did you know? 9 out of 10 stadium attendees remember the messaging on an aerial banner. Consumers see over 5,000 advertisements each day. Don’t choose to blend in with the masses. By choosing aerial advertising you’re making a statement that will impact the consumer whether they’re ready for it or not. By complementing your campaign with a ground team, you could take your aerial advertising campaign to the next level. Read more about how to do that here. 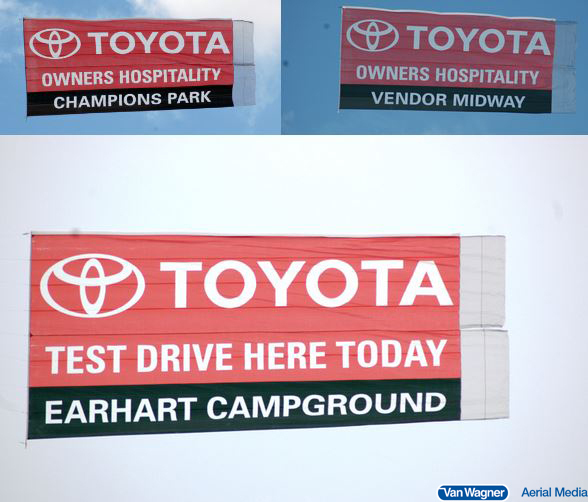 Once your banner’s creative has been produced, you can fly it at sporting events, music festivals, state fairs, beaches, and any other place where people have chosen to gather outdoors. One of the best things about aerial banners is that they’re portable. You can fly an NCAA football game in Florida one week, and then fly another game in Michigan the next. Need to add or change out a phone number or other form of messaging? Not a problem. Van Wagner Aerial Media can change out the copy at the bottom of your sign to make it more targeted. You can also add trailing letters to the back of any aerial advertisement to give it a refreshing new message. Check out what Toyota did below. Look at an aerial banner as an investment. It’s your brand’s own personal aerial billboard that can be used time and again. If you have any questions about flying NASCAR races, or any of our other capabilities, please don’t hesitate to contact us today. Our aerial sales coordinators are standing by to take your call. Or, click below for a free quote and we will get back to you as soon as possible. Download our free guide today for more information!